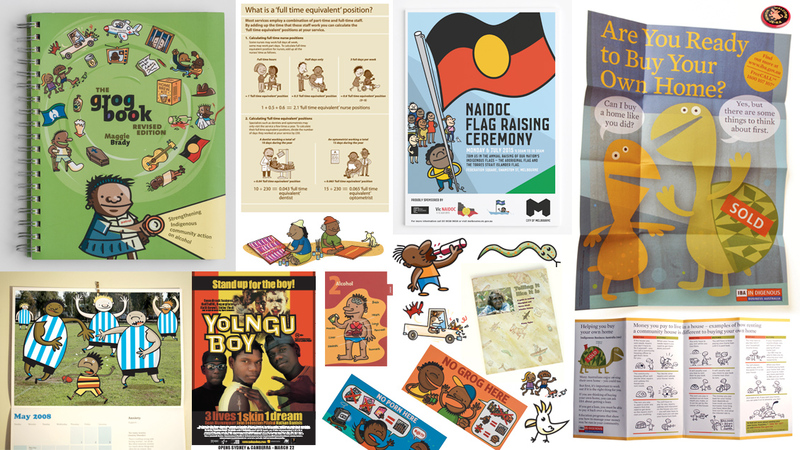 There are a lot of things to get right when producing communications for Aboriginal and Torres Strait Islanders. If the text is too complex or lengthy, nobody will read it; if its too simple it may sound patronising; if the imagery is too derivative, it can come across as clichéd or culturally offensive. With over 20 years of experience in this area, we understand what it takes to produce indigenous communications that work. We’ve produced educational tools for the Department of Health and Ageing and for FaHCSIA, posters for NT libraries, campaigns to raise mental health awareness, a recruitment brochure for BHP, training resources for health workers, and guides to help indigenous women with breast cancer. Our work has been highly effective: The Grog Book is still in use after 20 years, becoming a design standard for indigenous communications; Telling it Like It Is remains the only authentic guide to recording oral histories; and our work for FaHCSIA helped communities understand what was happening amidst the chaos of an abrupt intervention. It’s work we hold dear to our hearts, something we look back on with pride and a sense of achievement, and an area where we feel we still have so much more to contribute.